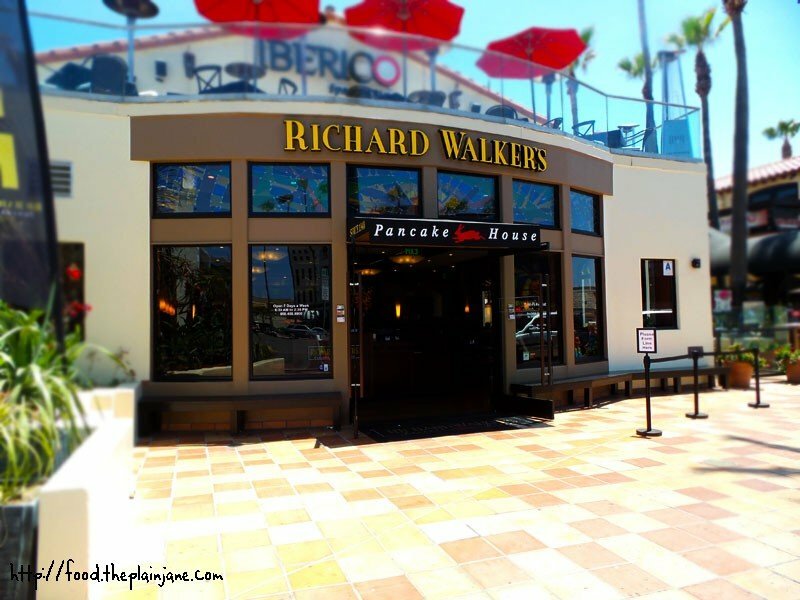 Richard Walker’s Pancake House has recently expanded in San Diego. The original location is in Downtown and a new spot just opened up in Downtown La Jolla. I was recently invited to come in and check out the new location and try out some of their tasty breakfast items. Jake and I don’t dine too often in La Jolla since parking can be a pain and it’s usually crowded around here. We managed to snag parking in our go-to parking area though – down by the Contemporary Art Museum which is just on the outskirts of the downtown area. It was a short walk to the restaurant from there and we arrived around 12PM. There was a long time out front and since I was invited, I walked in and we were seated not too long after a brief wait. Sorry people in line. Our very friendly waitress came by to take our drinks and asked if we wanted any coffee. I said I couldn’t drink hot coffee and she quickly offered to ice it for me – score! This is my iced coffee in a glass after I swirled in a little bit of their whipped cream in. The iced coffee was cold, smooth, creamy and just a touch sweet (from my spoonful of sugar and the whipping cream). Jake got regular coffee. I liked the coffee here though I can’t have too much of it. Our plate of accompaniments came out first before our food did – two little mini pitchers of maple syrup, loads of butter along with powdered sugar and lemon for Jake’s dish. Now this is the German Pancake. It’s this big fluffy baked pancake that rises up to look like this enormous thing! 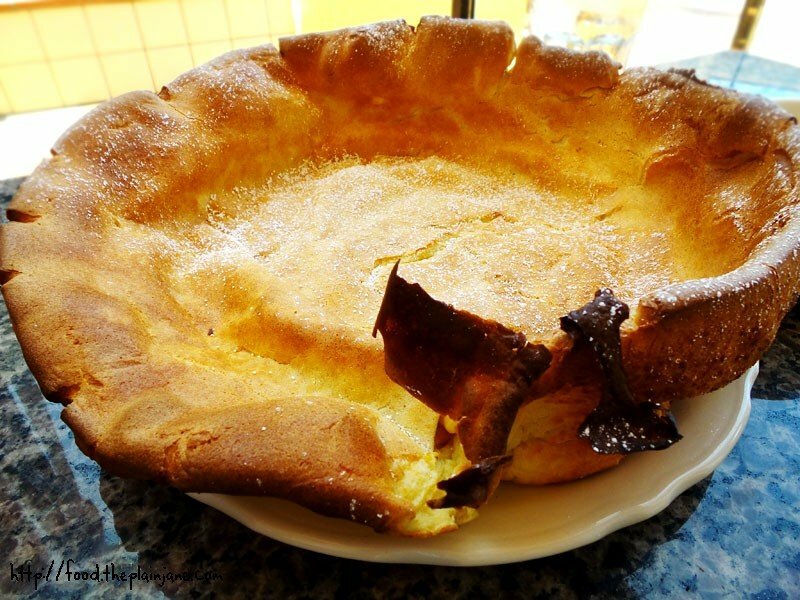 There’s also a smaller, not-bigger-than-your-plate version called a Dutch Baby if this is too intimidating or too much food for you to handle. Jake went all in and just got the big one. 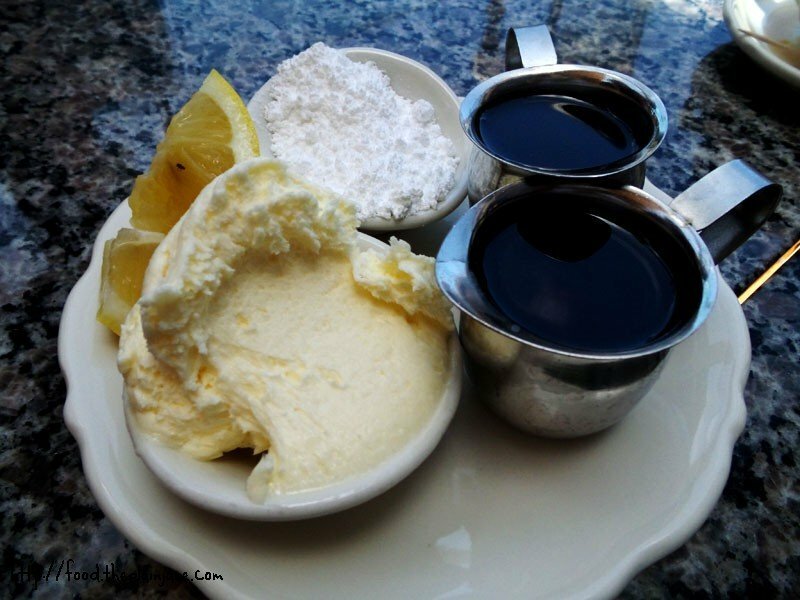 Typically what you do is add butter all over, then squeeze lemon juice on it and top it off with powdered sugar and then consume. Our waitress told us the best way to eat it is to add all of that and then roll it up! I had never heard that before so Jake did just as she said. Here’s how it looks all rolled up. Kind of looks like one of those jelly roll cakes, doesn’t it? Jake didn’t add enough lemon at first but he unrolled it and then added more and it tasted MUCH better. The lemon gives it a bright citrus flavor and the sweetness from the powdered sugar and creamy butter make like a glaze over the pancake. The pancake itself it light, fluffy and a little eggy. The edges are slightly crispy from baking in the oven, too. Very yummy! We both enjoyed this one a lot. I also wanted to try a baked pancake and the Baked Cinnamon Pecan Pancake sounded like the best one to me. Their Apple Pancakes are quite popular but I don’t really like apples in my pancakes (I’d rather have it in my pie) so I went with this one instead. 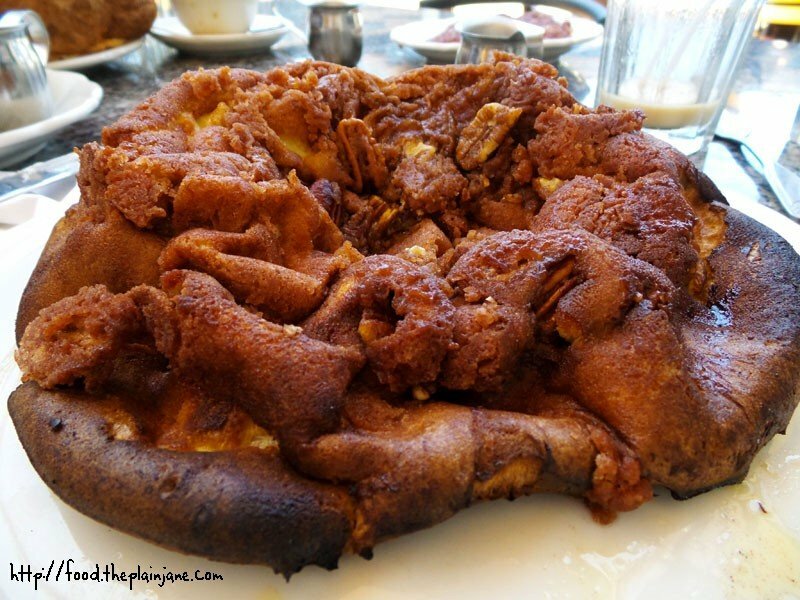 It starts off the same way the German Pancake is but instead they add oodles of pecans and cinnamon and it all kind of bakes together to create this mountain of a pancake. It looks like some terraforming happened here to create all of these little hills and ridges in my pancake! The pancake itself is thin, the same as the German Pancake, but instead has this cinnamon/sugar/pecan crumble on top that’s baked right in. It’s all caramelized and gooey and while it was delicious, it was far too sweet for me. I’m not sure what I was thinking – of course this sucker is going to be sweet – but it almost felt like having dessert for breakfast! This is definitely a “share it with someone” dish since it became too sweet to eat after a while. I still liked it, but too bad they don’t have a “dutch baby” version of this one. We also have to order hash browns at new breakfast spots. It’s a rule. We are always comparing hash browns to the beloved old Keith’s hash browns that are no longer around. These hash browns were just okay to me. The top had a nice golden color and was quite crisp, which seemed very promising. But underneath the hash browns are all broken up and separated and are in little sticks and were a touch dry. 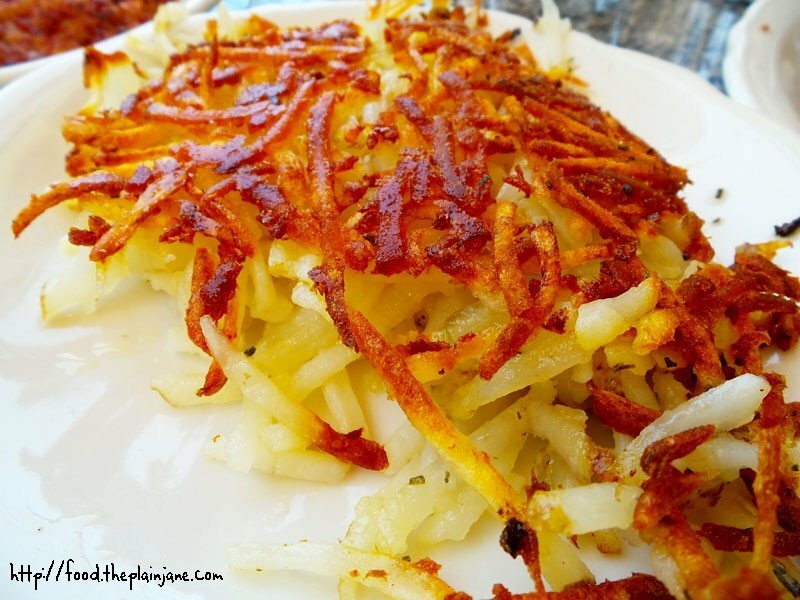 My perfect hash browns would be where the inside is soft and creamy – almost like mashed potatoes under the crispy top. Oh well, these were not quite there but they weren’t a bad version. At least they were crispy on top! What is this? Corned beef again? But of course! I love this stuff and I keep ordered it when we go places even though Jake says he doesn’t like corned beef hash. 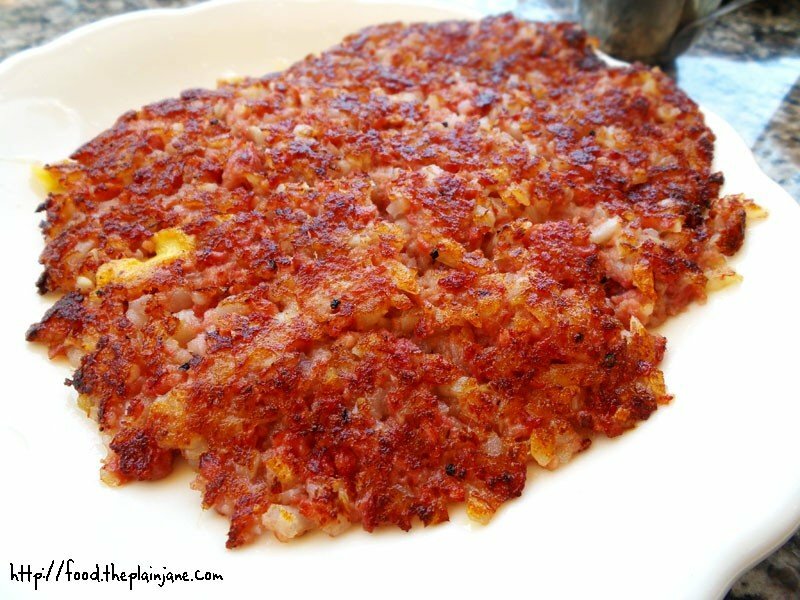 The corned beef hash at Richard Walker’s though is different – it has some seasonings and spices that make it taste not quite like corned beef, which made Jake like them (GASP). He said they tasted more like a regular beef plate – like ground meat or steak – rather than corned beef. This had a nice crispy top with the little diced potatoes throughout it. I liked it a lot, too (though not as much as the corned beef hash I had in Boston, but, oh well) and it tasted so much different than any other corned beef I’ve tried. But I couldn’t pinpoint exactly what made it different. Luckily the different taste didn’t deter me from liking it. Just know that it’s not like other corned beefs – less salty, more flavor, different texture, almost “meatier” if that makes any kind of sense at all. Jake and I enjoyed our visit to Richard Walker’s. We had great service from our very friendly and helpful waitress and it was a beautiful morning to enjoy a little breakfast outside on the patio. 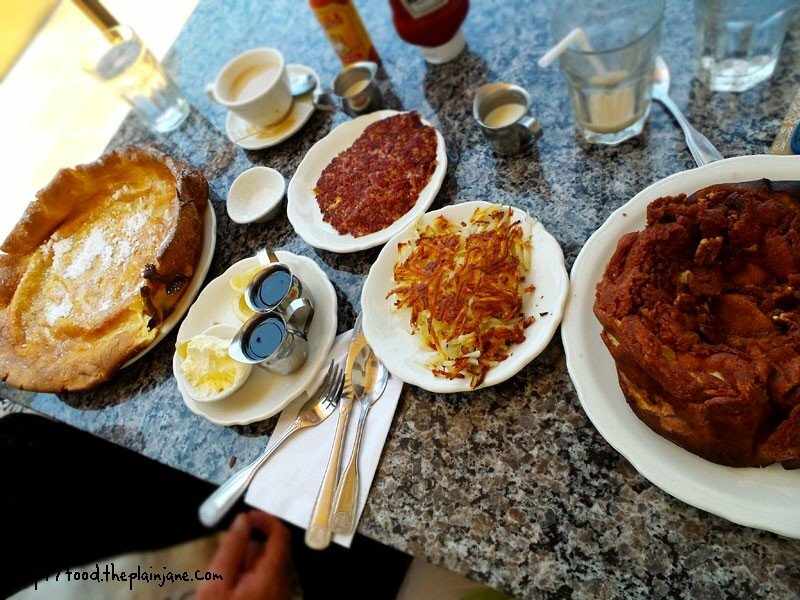 I’d definitely love to come back and try out their regular pancakes or their crepes – they’ve got a pretty extensive breakfast menu and you’re sure to find something for everyone! Disclaimer: I was invited to dine at Richard Walker’s thanks to BAM Communications. Our meal was complimentary and I was not further compensated for this review. All opinions, photos, and quips are my own. 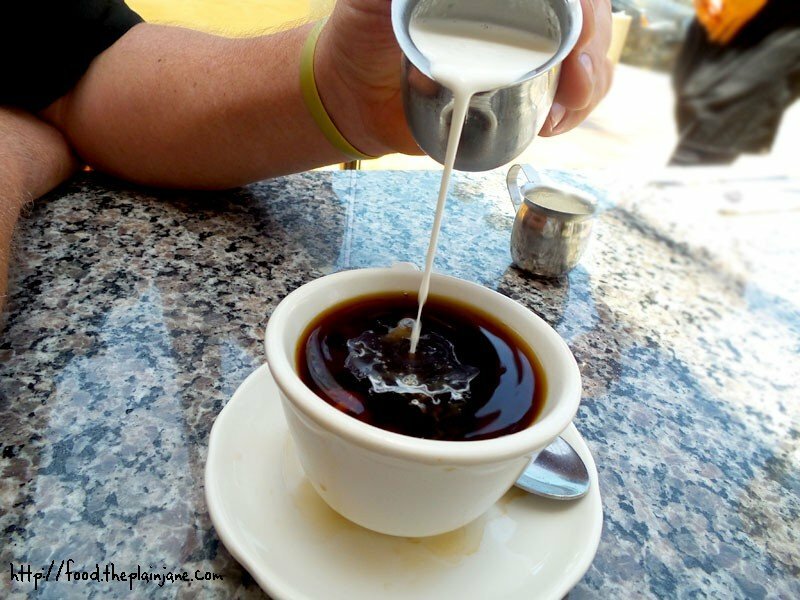 I didn’t think they used real heavy cream for the coffee when I visited. That’s super cool your waitress made yours into an iced coffee. 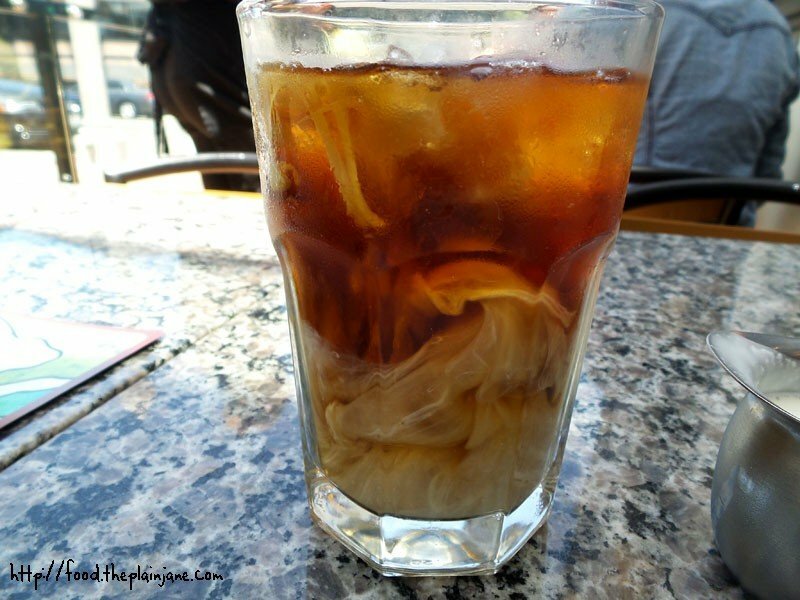 Too bad they don’t offer (already prepared in fridge) iced coffee in general (versus pouring hot scalding coffee over ice – it gives me anxiety when people do that). That is an INSANE amount of butter they offer for the german! Awesome. Simply awesome. I’ve never heard of rolling it up the like a crepe though. Usually my dad would just schmear butter on the pancake, then squeeze lemon, then sprinkle with powder sugar. 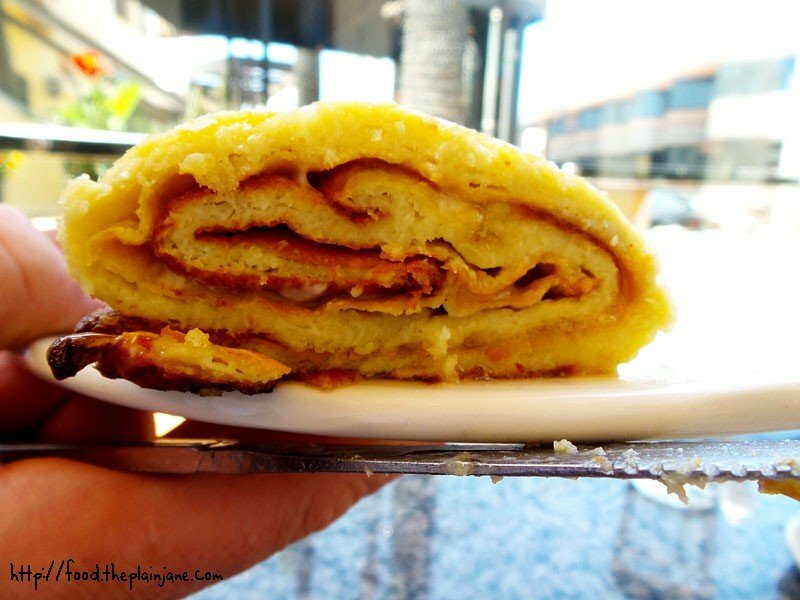 Agreed that the lemon brings out the best in this pancake. I hate cooked apples in just about everything so the baked cinnamon one you ordered looks frekkin’ good!!! Was it better than your beloved Dutch crumble julian apple pie? The photo of that pancake looks like a bundt cake I made once (that obviously came out wrong and ugly). The pancake does look cloyingly sweet though – but I probably wouldn’t care since there’s no apples in it AND I’ll probably only eat a few bites of the pancake before being satisfied. It’s funny b/c I was JUST missing Keiths this weekend. They had the best chicken fried steak with country gravy that I miss so much 🙁 Glad someone else liked Keiths. Hi Faye – Jake made me take a sip of the cream and it was so so so rich. Ugh. I don’t know how he talked me into that, I just like to pour it into other things! I had never heard of rolling it up before either but it made it way easier to eat so it’s a brilliant idea. Then all of the “stuff” on top gets mixed in with everything else. You need plenty of lemon to make it shine in my opinion, otherwise it just takes like powdered sugar and that’s no fun. Haha, I think I’d still rather have my dutch crumb apple pie! The pancake was good but it was too much to eat alone for breakfast – I was glad we ordered other items, too, and that Jake shared his pancake with me. Awww, man, I miss Keith’s so much! I used to go there a lot in my college days for late night meals (in the summer). I loved their biscuits and gravy, too (I think it was the #5 special that I always ordered and it was like… $5 or something). I refuse to go to the IHOP that replaced my beloved Keith’s! Those pancakes are huge! TC would like the one that roll up with lemon and sugar. That corned beef is more of what I’d eat. I like savory over sweet for breakfast most of the time. Yeah, the pancakes are HUGE. We took home lots of leftovers – I’m pretty sure we could have split this whole meal with Jake’s kids and been happy. 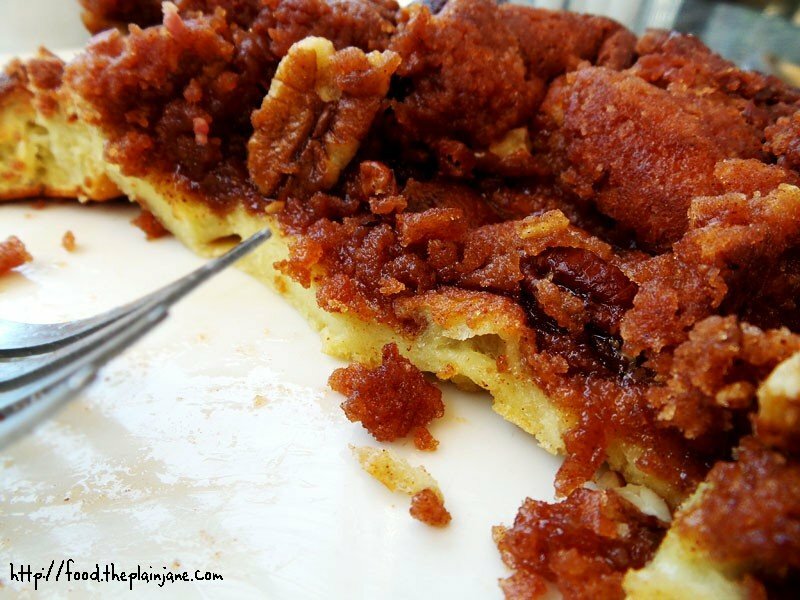 I also like savory over sweet but the cinnamon pecan pancake was calling to me that day, haha. I got the side of corned beef for my savory component! Everyone’s been going to this place it seems! I don’ t love pancakes because they can be a little bready/boring but I think I might like dutch babys or German pancakes. And I like that you squeeze lemon on it. The baked cinnamon one looks like a satellite shot of Mars or something!